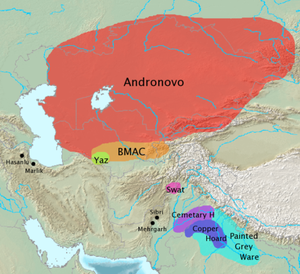 Map of the Sintashta-Petrovka culture (red), its expansion into the Andronovo culture (orange) during the 2nd millennium BC, showing the overlap with the Bactria–Margiana Archaeological Complex (chartreuse green) in the south. The location of the earliest chariots is shown in magenta. The term Aryan has been used historically to denote the Indo-Iranians, because Arya is the self designation of the ancient speakers of the Indo-Iranian languages, specifically the Iranian and the Indo-Aryan peoples, collectively known as the Indo-Iranians. Some scholars now use the term Indo-Iranian to refer to this group, while the term "Aryan" is used to mean "Indo-Iranian" by other scholars such as Josef Wiesehofer, Will Durant, and Jaakko Häkkinen. Population geneticist Luigi Luca Cavalli-Sforza, in his 1994 book The History and Geography of Human Genes, also uses the term Aryan to describe the Indo-Iranians. The early Indo-Iranians are commonly identified with the descendants of the Proto-Indo-Europeans known as the Sintashta culture and the subsequent Andronovo culture within the broader Andronovo horizon, and their homeland with an area of the Eurasian steppe that borders the Ural River on the west, the Tian Shan on the east (where the Indo-Iranians took over the area occupied by the earlier Afanasevo culture), and Transoxiana and the Hindu Kush on the south. Historical linguists broadly estimate that a continuum of Indo-Iranian languages probably began to diverge by 2000 BC, if not earlier,:38–39 preceding both the Vedic and Iranian cultures. The earliest recorded forms of these languages, Vedic Sanskrit and Gathic Avestan, are remarkably similar, descended from the common Proto-Indo-Iranian language. The origin and earliest relationship between the Nuristani languages and that of the Iranian and Indo-Aryan groups is not completely clear. 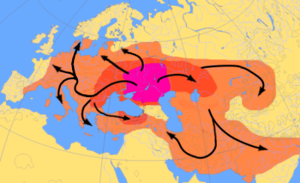 Scheme of Indo-European migrations from c. 4000 to 1000 BC according to the Kurgan hypothesis. The magenta area corresponds to the assumed Urheimat (Samara culture, Sredny Stog culture). The red area corresponds to the area which may have been settled by Indo-European-speaking peoples up to c. 2500 BC; the orange area to 1000 BC. Two-wave models of Indo-Iranian expansion have been proposed by Burrow (1973) and Parpola (1999). The Indo-Iranians and their expansion are strongly associated with the Proto-Indo-European invention of the chariot. It is assumed that this expansion spread from the Proto-Indo-European homeland north of the Caspian sea south to the Caucasus, Central Asia, the Iranian plateau, and Northern India. They also expanded into Mesopotamia and Syria and introduced the horse and chariot culture to this part of the world. Sumerian texts from EDIIIb Girsu (2500–2350 BC) already mention the 'chariot' (gigir) and Ur III texts (2150–2000 BC) mention the horse (anshe-zi-zi). the names of gods invoked by these rulers in treaties. In particular, Kikkuli's text includes words such as aika "one" (i.e. a cognate of the Indo-Aryan eka), tera "three" (tri), panza "five" (pancha), satta "seven", (sapta), na "nine" (nava), and vartana "turn around", in the context of a horse race (Indo-Aryan vartana). In a treaty between the Hittites and the Mitanni, the Ashvin deities Mitra, Varuna, Indra, and Nasatya are invoked. These loanwords tend to connect the Mitanni superstrate to Indo-Aryan rather than Iranian languages – i.e. the early Iranian word for "one" was aiva. The standard model for the entry of the Indo-European languages into the Indian subcontinent is that this first wave went over the Hindu Kush, either into the headwaters of the Indus and later the Ganges. The earliest stratum of Vedic Sanskrit, preserved only in the Rigveda, is assigned to roughly 1500 BC. :258 From the Indus, the Indo-Aryan languages spread from c. 1500 BC to c. 500 BC, over the northern and central parts of the subcontinent, sparing the extreme south. The Indo-Aryans in these areas established several powerful kingdoms and principalities in the region, from south eastern Afghanistan to the doorstep of Bengal. The most powerful of these kingdoms were the post-Rigvedic Kuru (in Kurukshetra and the Delhi area) and their allies the Pañcālas further east, as well as Gandhara and later on, about the time of the Buddha, the kingdom of Kosala and the quickly expanding realm of Magadha. The latter lasted until the 4th century BC, when it was conquered by Chandragupta Maurya and formed the center of the Mauryan empire. In eastern Afghanistan and southwestern Pakistan, whatever Indo-Aryan languages were spoken there were eventually pushed out by the Iranian languages. Most Indo-Aryan languages, however, were and still are prominent in the rest of the Indian subcontinent. Today, Indo-Aryan languages are spoken in India, Pakistan, Bangladesh, Nepal, Sri Lanka, Fiji, Suriname and the Maldives. The second wave is interpreted as the Iranian wave. :42–43 The first Iranians to reach the Black Sea may have been the Cimmerians in the 8th century BC, although their linguistic affiliation is uncertain. They were followed by the Scythians, who are considered a western branch of the Central Asian Sakas. Sarmatian tribes, of whom the best known are the Roxolani (Rhoxolani), Iazyges (Jazyges) and the Alani (Alans), followed the Scythians westwards into Europe in the late centuries BC and the 1st and 2nd centuries AD (The Age of Migrations). The populous Sarmatian tribe of the Massagetae, dwelling near the Caspian Sea, were known to the early rulers of Persia in the Achaemenid Period. At their greatest reported extent, around 1st century AD, the Sarmatian tribes ranged from the Vistula River to the mouth of the Danube and eastward to the Volga, bordering the shores of the Black and Caspian seas as well as the Caucasus to the south. In the east, the Saka occupied several areas in Xinjiang, from Khotan to Tumshuq. The Medians, Persians and Parthians begin to appear on the Iranian plateau from c. 800 BC, and the Achaemenids replaced Elamite rule from 559 BC. Around the first millennium AD, Iranian groups began to settle on the eastern edge of the Iranian plateau, on the mountainous frontier of northwestern and western Pakistan, displacing the earlier Indo-Aryans from the area. In Eastern Europe, the Iranians were eventually decisively assimilated (e.g. Slavicisation) and absorbed by the Proto-Slavic population of the region, while in Central Asia, the Turkic languages marginalized the Iranian languages as a result of the Turkic expansion of the early centuries AD. Extant major Iranian languages are Persian, Pashto, Kurdish, and Balochi besides numerous smaller ones. Ossetian, primarily spoken in North Ossetia and South Ossetia, is a direct descendant of Alanic, and by that the only surviving Sarmatian language of the once wide-ranging East Iranian dialect continuum that stretched from Eastern Europe to the eastern parts of Central Asia. The Indo-European language spoken by the Indo-Iranians in the late 3rd millennium BC was a Satem language still not removed very far from the Proto-Indo-European language, and in turn only removed by a few centuries from Vedic Sanskrit of the Rigveda. The main phonological change separating Proto–Indo-Iranian from Proto–Indo-European is the collapse of the ablauting vowels *e, *o, *a into a single vowel, Proto–Indo-Iranian *a (but see Brugmann's law). Grassmann's law and Bartholomae's law were also complete in Proto–Indo-Iranian, as well as the loss of the labiovelars (kw, etc.) to k, and the Eastern Indo-European (Satem) shift from palatized k' to ć, as in Proto–Indo-European *k'ṃto- > Indo-Iran. *ćata- > Sanskrit śata-, Old Iran. sata "100". Among the sound changes from Proto–Indo-Iranian to Indo-Aryan is the loss of the voiced sibilant *z, among those to Iranian is the de-aspiration of the PIE voiced aspirates. Despite the introduction of later Hindu and Zoroastrian scriptures, Indo-Iranians shared a common inheritance of concepts including the universal force *Hṛta- (Sanskrit rta, Avestan asha), the sacred plant and drink *sawHma- (Sanskrit Soma, Avestan Haoma) and gods of social order such as *mitra- (Sanskrit Mitra, Avestan and Old Persian Mithra, Miϑra) and *bʰaga- (Sanskrit Bhaga, Avestan and Old Persian Baga). Proto-Indo-Iranian religion is an archaic offshoot of Indo-European religion. From the various and dispersed Indo-Iranian cultures, a set of common ideas may be reconstructed from which a common, unattested proto-Indo-Iranian source may be deduced. Beliefs developed in different ways as cultures separated and evolved. For example, the cosmo-mythology of the peoples that remained on the Central Asian steppes and the Iranian plateau is to a great degree unlike that of the Indians, focused more on groups of deities (*daiva and *asura) and less on the divinities individually. Indians were less conservative than Iranians in their treatment of their divinities, so that some deities were conflated with others or, conversely, aspects of a single divinity developed into divinities in their own right. By the time of Zoroaster, Iranian culture had also been subject to the upheavals of the Iranian Heroic Age (late Iranian Bronze Age, 1800–800 BCE), an influence that the Indians were not subject to. Sometimes certain myths developed in altogether different ways. The Rig-Vedic Sarasvati is linguistically and functionally cognate with Avestan *Haraxvaitī Ārəduuī Sūrā Anāhitā. In the Rig-Veda (6,61,5–7) she battles a serpent called Vritra, who has hoarded all of the Earth's water. In contrast, in early portions of the Avesta, Iranian *Harahvati is the world-river that flows down from the mythical central Mount Hara. But *Harahvati does no battle — she is blocked by an obstacle (Avestan for obstacle: vərəϑra) placed there by Angra Mainyu. The following is a list of cognate terms that may be gleaned from comparative linguistic analysis of the Rigveda and Avesta. Both collections are from the period after the proposed date of separation (ca. 2nd millennium BCE) of the Proto-Indo-Iranians into their respective Indic and Iranian branches. *Hāpš āp āp "water," āpas "the Waters"
*Hapām Napāts Apam Napat, Apām Napāt Apām Napāt the "water's offspring"
*Hr̥tas rta asha/arta "active truth", extending to "order" & "righteousness"
*atharwan atharvan āϑrauuan, aϑaurun "priest"
*Haǰʰiš ahi azhi, (aži) "dragon, snake", "serpent"
*mitra mitra mithra, miϑra "oath, covenant"
*sarwatāt sarvatat Hauruuatāt "intactness", "perfection"
*top ~ *tep Tapati tapaiti Possible fire/solar goddess; see Tabiti (a possibly Hellenised Scythian theonym). Cognate with Latin tepeo and several other terms. *wr̥tras Vrtra- verethra, vərəϑra (cf. Verethragna, Vərəϑraγna) "obstacle"
*yaĵnas yajña yasna, object: yazata "worship, sacrifice, oblation"
R1a1a (R-M17 or R-M198) is the sub-clade most commonly associated with Indo-European speakers. Most discussions purportedly of R1a origins are actually about the origins of the dominant R1a1a (R-M17 or R-M198) sub-clade. Data so far collected indicates that there are two widely separated areas of high frequency, one in the Indian subcontinent, around North India, and the other in Eastern Europe, around Poland and Ukraine. The historical and prehistoric possible reasons for this are the subject of on-going discussion and attention amongst population geneticists and genetic genealogists, and are considered to be of potential interest to linguists and archaeologists also. Out of 10 human male remains assigned to the Andronovo horizon from the Krasnoyarsk region, 9 possessed the R1a Y-chromosome haplogroup and one C-M130 haplogroup (xC3). mtDNA haplogroups of nine individuals assigned to the same Andronovo horizon and region were as follows: U4 (2 individuals), U2e, U5a1, Z, T1, T4, H, and K2b. 90% of the Bronze Age period mtDNA haplogroups were of west Eurasian origin and the study of three key genes known to be involved in human pigmentation pathways —HERC2, SLC45A2, and TYR— provide direct evidence of strong selection favoring blue (or green)-eyes, fair-skin and light-hair. This also correlates with first hand accounts written by ancient historians, including Pliny the Elder who characterizes the Iranic tribe Seres as red-haired and blue-eyed; and Ammianus Marcellinus who wrote that the Alans, another Iranic tribe, were tall, blond and light-eyed. A 2004 study also established that during the Bronze Age/Iron Age period, the majority of the population of Kazakhstan (part of the Andronovo culture during Bronze Age), was of west Eurasian origin (with mtDNA haplogroups such as U, H, HV, T, I and W), and that prior to the 13th–7th century BC, all Kazakh samples belonged to European lineages. ^ Naseer Dashti (8 October 2012). The Baloch and Balochistan: A historical account from the Beginning to the fall of the Baloch State. Trafford Publishing. ISBN 978-1-4669-5897-5. ^ The "Aryan" Language, Gherardo Gnoli, Instituto Italiano per l'Africa e l'Oriente, Roma, 2002. ^ Häkkinen, Jaakko (2012). "Early contacts between Uralic and Yukaghir". In Tiina Hyytiäinen; Lotta Jalava; Janne Saarikivi; Erika Sandman (eds.). Per Urales ad Orientem (Festschrift for Juha Janhunen on the occasion of his 60th birthday on 12 February 2012) (PDF). Helsinki: Finno-Ugric Society. ISBN 978-952-5667-34-9. Retrieved 12 November 2013. ^ Häkkinen, Jaakko (23 September 2012). "Problems in the method and interpretations of the computational phylogenetics based on linguistic data – An example of wishful thinking: Bouckaert et al. 2012" (PDF). Jaakko Häkkisen puolikuiva alkuperäsivusto. Jaakko Häkkinen. Retrieved 12 November 2013. ^ Brzezinski, Richard; Mielczarek, Mariusz (2002). The Sarmatians, 600 BC-AD 450. Osprey Publishing. p. 39. (..) Indeed, it is now accepted that the Sarmatians merged in with pre-Slavic populations. ^ Adams, Douglas Q. (1997). Encyclopedia of Indo-European Culture. Taylor & Francis. p. 523. (..) In their Ukrainian and Polish homeland the Slavs were intermixed and at times overlain by Germanic speakers (the Goths) and by Iranian speakers (Scythians, Sarmatians, Alans) in a shifting array of tribal and national configurations. ^ Atkinson, Dorothy; et al. (1977). Women in Russia. Stanford University Press. p. 3. (..) Ancient accounts link the Amazons with the Scythians and the Sarmatians, who successively dominated the south of Russia for a millennium extending back to the seventh century B.C. The descendants of these peoples were absorbed by the Slavs who came to be known as Russians. ^ Slovene Studies. 9–11. Society for Slovene Studies. 1987. p. 36. (..) For example, the ancient Scythians, Sarmatians (amongst others), and many other attested but now extinct peoples were assimilated in the course of history by Proto-Slavs. ^ a b c Gnoli, Gherardo (March 29, 2012). "INDO-IRANIAN RELIGION". Encyclopædia Iranica. Retrieved July 10, 2018. ^ Keyser, Christine; Bouakaze, Caroline; Crubézy, Eric; Nikolaev, Valery G.; Montagnon, Daniel; Reis, Tatiana; Ludes, Bertrand (2009). "Ancient DNA provides new insights into the history of south Siberian Kurgan people". Human Genetics. 126 (3): 395–410. doi:10.1007/s00439-009-0683-0. PMID 19449030. ^ Wilde, Sandra; Timpson, Adrian; Kirsanow, Karola; Kaiser, Elke; Kayser, Manfred; Unterländer, Martina; Hollfelder, Nina; Potekhina, Inna D.; Schier, Wolfram (2014-04-01). "Direct evidence for positive selection of skin, hair, and eye pigmentation in Europeans during the last 5,000 y". Proceedings of the National Academy of Sciences of the United States of America. 111 (13): 4832–4837. doi:10.1073/pnas.1316513111. ISSN 0027-8424. PMC 3977302. PMID 24616518. ^ Lalueza-Fox, C.; Sampietro, M. L.; Gilbert, M. T.; Castri, L.; Facchini, F.; Pettener, D.; Bertranpetit, J. (2004). "Unravelling migrations in the steppe: Mitochondrial DNA sequences from ancient central Asians". Proceedings. Biological Sciences. 271 (1542): 941–947. doi:10.1098/rspb.2004.2698. PMC 1691686. PMID 15255049. Diakonoff, Igor M.; Kuz'mina, E. E.; Ivantchik, Askold I. (1995), "Two Recent Studies of Indo-Iranian Origins", Journal of the American Oriental Society, American Oriental Society, 115 (3), pp. 473–477, doi:10.2307/606224, JSTOR 606224 . Jones-Bley, K.; Zdanovich, D. G. (eds. ), Complex Societies of Central Eurasia from the 3rd to the 1st Millennium BC, 2 vols, JIES Monograph Series Nos. 45, 46, Washington D.C. (2002), ISBN 0-941694-83-6, ISBN 0-941694-86-0. Kuz'mina, Elena Efimovna (1994), Откуда пришли индоарии? (Whence came the Indo-Aryans), Moscow: Российская академия наук (Russian Academy of Sciences) . Mallory, J.P. (1989), In Search of the Indo-Europeans: Language, Archaeology, and Myth, London: Thames & Hudson . Mallory, J. P.; Adams, Douglas Q. (1997), "Indo-Iranian Languages", Encyclopedia of Indo-European Culture, Fitzroy Dearborn . Mallory, J. P.; Mair, Victor H. (2000), The Tarim Mummies: Ancient China and the Mystery of the Earliest People from the West, London: Thames & Hudson . Parpola, Asko (1999), "The formation of the Aryan branch of Indo-European", in Blench, Roger; Spriggs, Matthew (eds. ), Archaeology and Language, III: Artefacts, languages and texts, London and New York: Routledge . Witzel, Michael (2000), "The Home of the Aryans" (PDF), in Hintze, A.; Tichy, E. (eds. ), Anusantatyai. Fs. für Johanna Narten zum 70. Geburtstag, Dettelbach: J.H. Roell, pp. 283–338 . Chopra, R. M., "Indo-Iranian Cultural Relations Through The Ages", Iran Society, Kolkata, 2005.